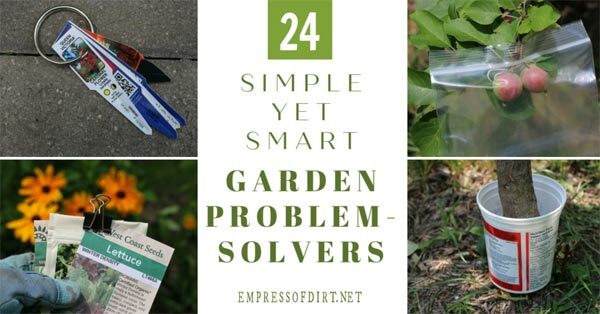 Sometimes the solution to your garden problem is right in your kitchen drawer! Check out these simple, effective problem-solvers and let me know any you have any to add. I love it when the answer is easy without the need to spend money. This article fits nicely with the rest of my series on how we live debt-free and avoid The Man. 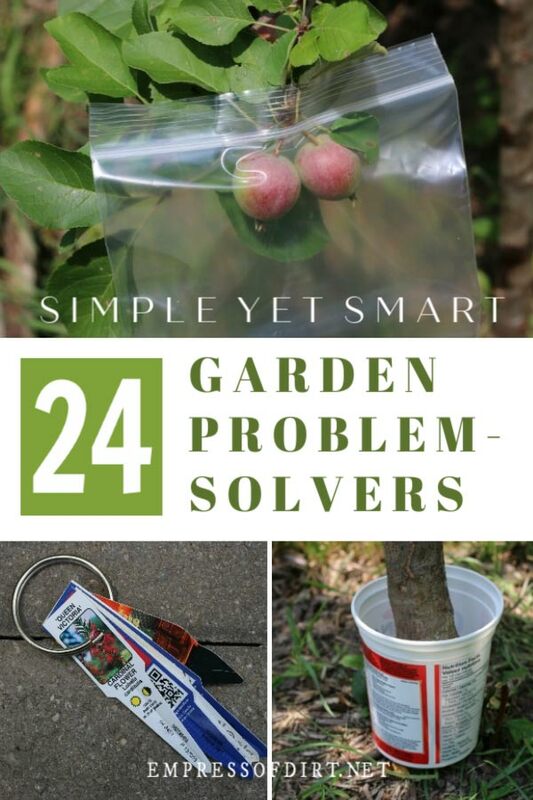 You can also find 10 Smart and Frugal Garden Hacks here. 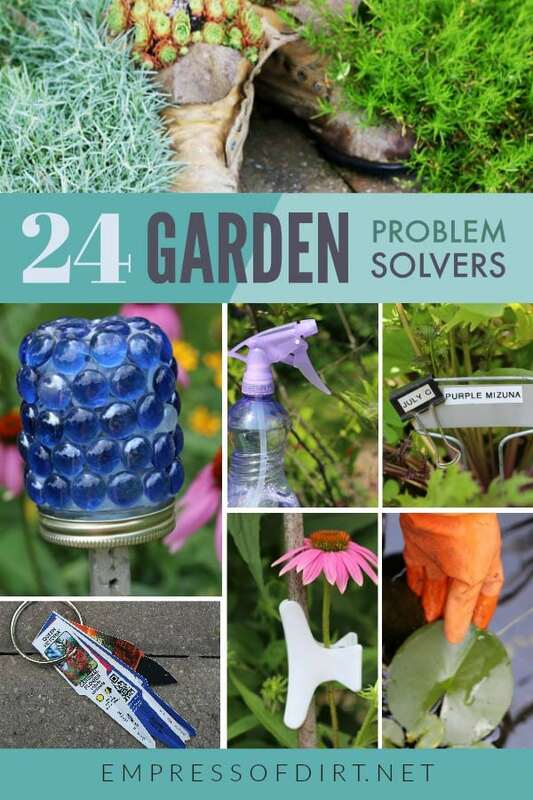 Got a garden problem? The solution may already be in your house and not cost a thing. 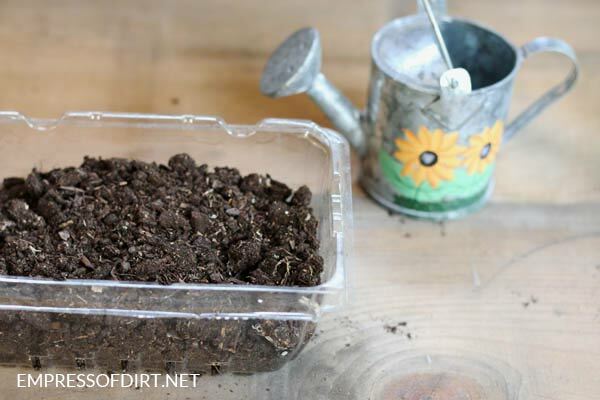 I’ve gathered some favorite tips and tricks for using household items in the garden. All the ideas are frugal. None of them will win me a Nobel Prize—or will they?—but they do work and make things easier. There is such a reflex in our culture to race to the store every time something isn’t working as well as we’d like. It’s most satisfying to let that go and use what you have instead. Most garden gloves are not waterproof. 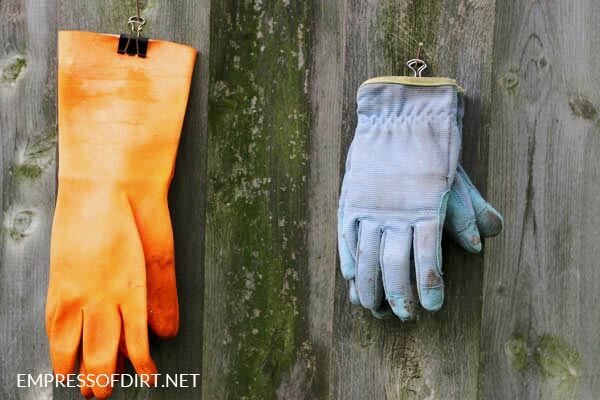 Keep a pair of good quality dishwashing gloves with your garden tools. I like them for cleaning the pond and washing flower pots. Look for extra-long ones that cover your wrists too. 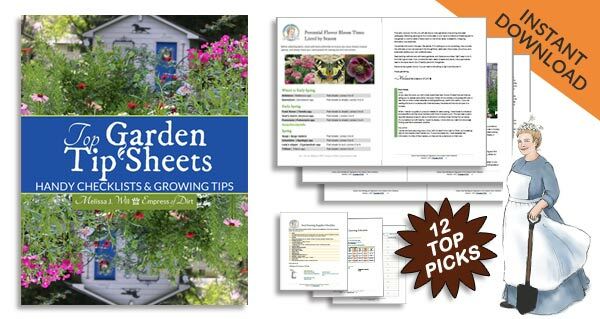 This is a simple way of keeping track of what you plant each season. 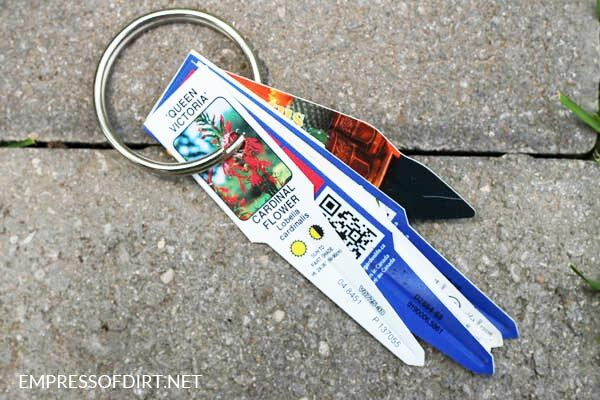 Hole punch your plant tags and keep them handy on a key ring. Make sure to punch the hole in the image so you don’t remove any helpful information from the tag. 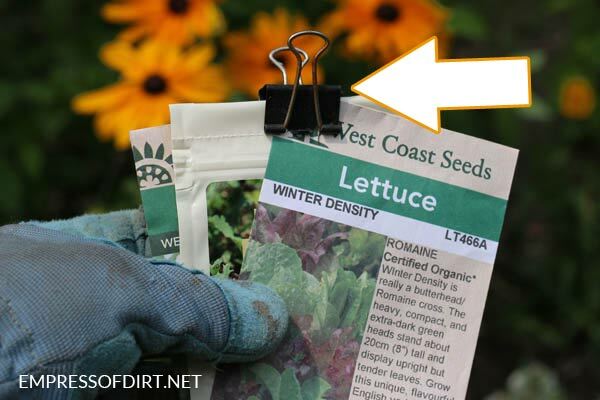 There are so many uses for binder clips (also called bulldog clips) in the garden. 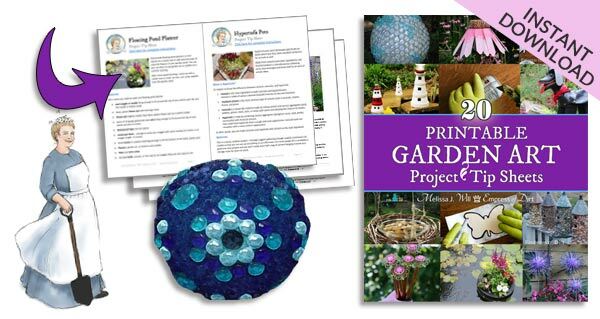 I use them when planting seeds to make sure the packets stay shut and the seeds don’t spill. See how the clip has ‘July C’ on it? To keep track of harvest dates, I add these date clips to my plant tags noting the estimated date when the crop should be ready to pick. In case you’re wondering about my system, the beginning of the month is A, the middle is B, and the end is C.
This post shows the label maker and tape I used for long-lasting plant tags. That blanket-like thing over the raised bed is a row cover. These protect tender crops from cold weather. 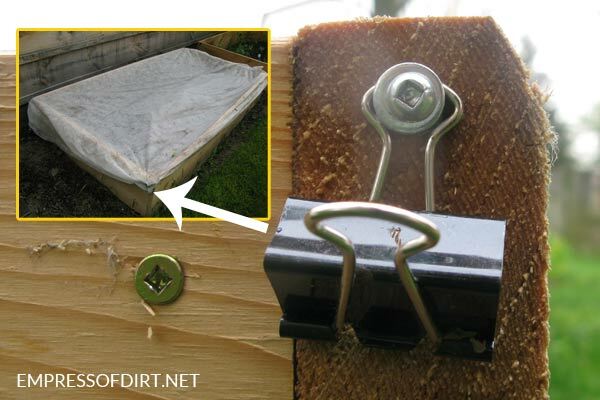 I attach binder clips to each outside corner of my raised beds and them to hold the row covers in place. Binder clips make good glove hangers. 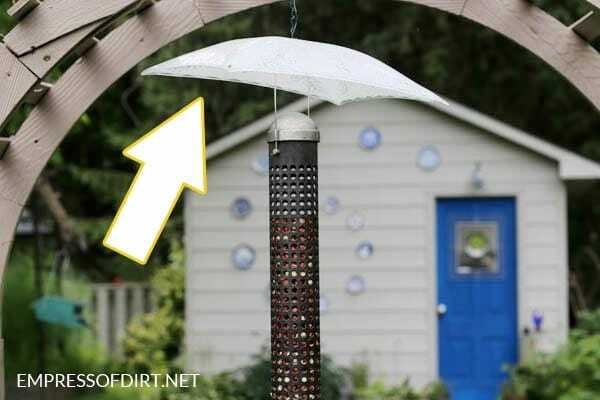 I have several of them in my garden tool area and hang my gloves to dry after each use. 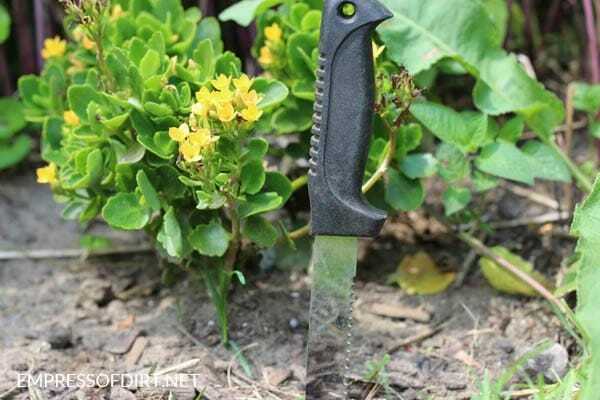 If you don’t want to spend money on a good but pricey garden knife, have a look in your kitchen or a local thrift shop. This serrated knife cost me 25 cents and works great. This tube peanut feeder is intended for woodpeckers and nuthatches. I keep a ceiling light cover hanging over the top to prevent squirrels from jumping on it. Plus, it keeps the rain off the peanuts. Check thrift shops and yard sales to get one. 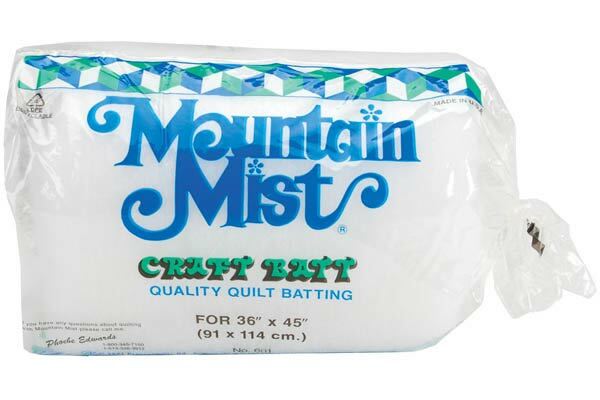 Polyester quilt batting is excellent for cleaning a small, gunky garden pond. Wrap it around a metal basket and place your pond pump inside. The water will be cleaned as it passes through the batting on its way to the pump intake. Change the batting as needed. 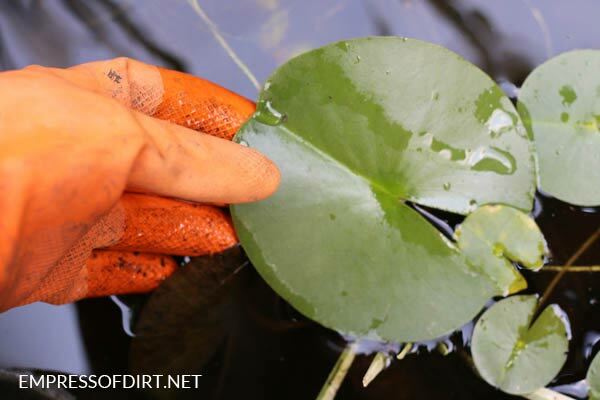 There are complete pond filter instructions with a video demonstration here. It really works! See that tiger pattern? It’s an old pair of pantyhose now repurposed as a melon holder. 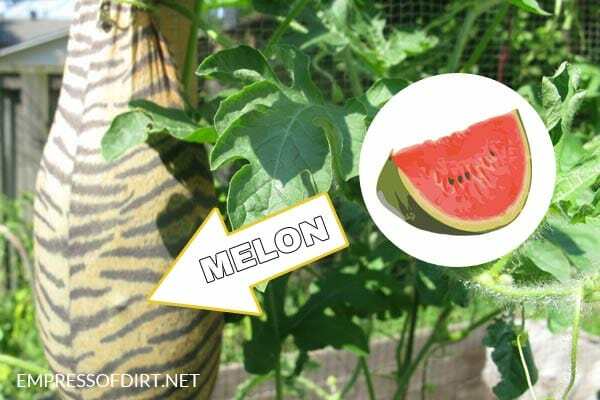 When space is limited, it’s necessary to grow melons vertically on trellis. When the fruit gets large, I place it in a leg of pantyhose and tie it to the trellis, so the weight of the melon won’t cause it to snap off the vine before it’s ripe. 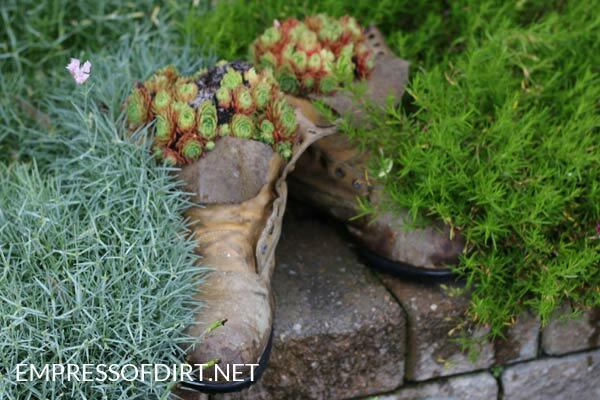 Love those old boots but can’t wear them anymore? There’s lots of ways to use old food jars. 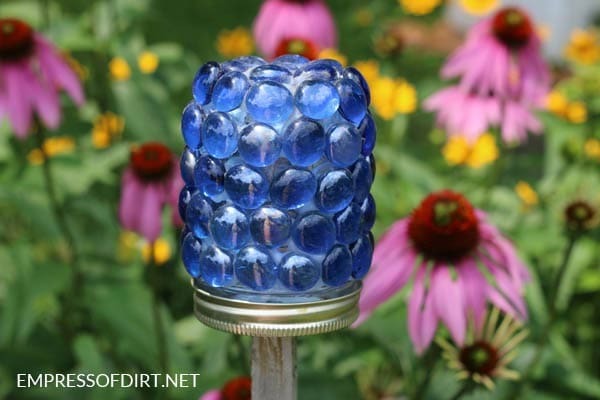 Here I decorated the jar with flat-bottom marbles and attached the lid to a wood post to make a hose guard. Hose guards keep garden hose from crushing your plants. 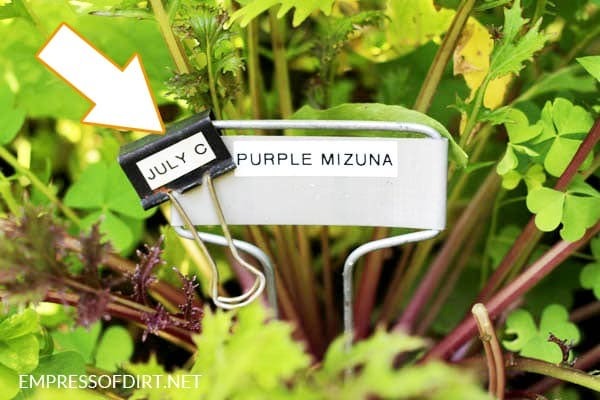 Want plant tags and markers that won’t fade or peel no matter what the weather? 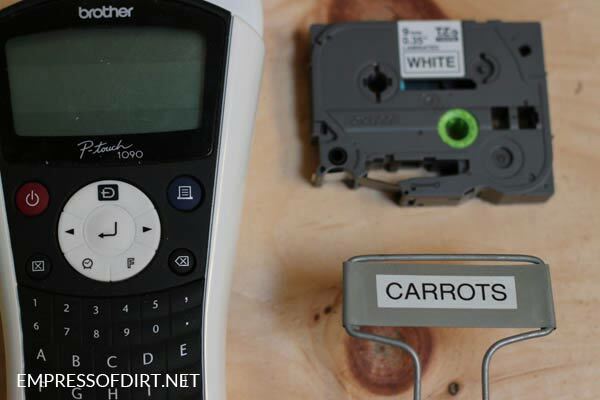 Get a label maker and waterproof tape. These tags will last for many years to come. You can see more about the long-lasting metal plant markers here. Some naughty critter was nibbling at the base of my apple tree. I removed the bottom of a yogurt container and made a slit up one side. 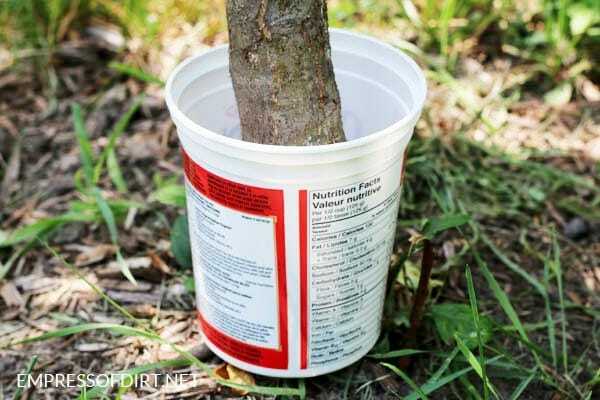 Placed around the tree base, no more critter nibbles. See the bamboo skewers inside the plastic bags? This is my ‘mini greenhouse’ for growing clematis vines from cuttings. 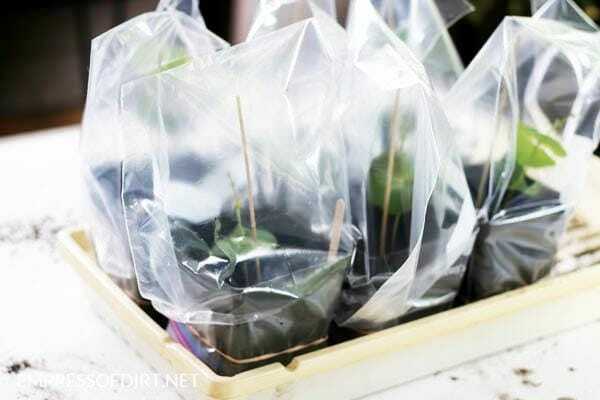 The skewers keep the plastic bags from resting on the plants. Chopsticks work well too. Find both at dollar stores. Broken dishes (and containers like this bunny one) have lots of reuses in the garden. 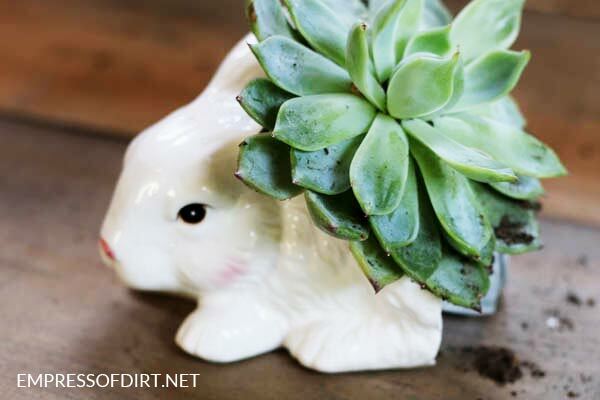 I use broken plates for mosaic art pieces and this half-rabbit is now a succulent planter. Keep a good sharp seam ripper or letter opener with your garden supplies. 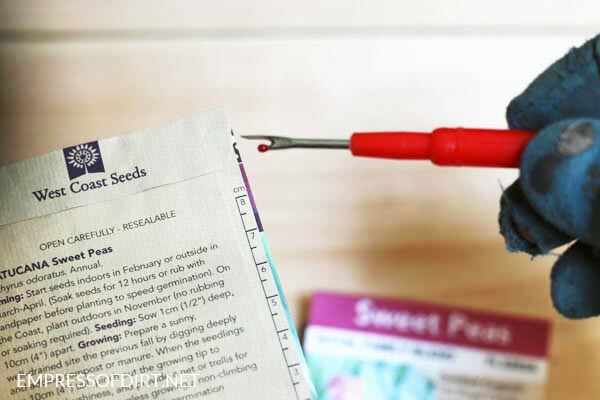 This makes it much easier to carefully open seed packets without tearing the paper. Some have important information on the top flap that I don’t want to rip! Hair clips make good lightweight plant supports. They come in all different sizes and work well with many plants including orchids and vines. Here I’m supporting a coneflower that kept falling over. Something eating your apples on the tree? 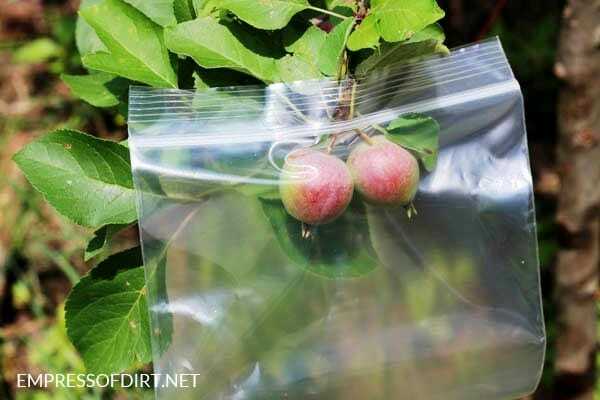 Use a plastic sandwich bag to protect the ripening fruit. Cut a few air holes and close the zip lock around the stem and hold things in place with a binder clip. If I don’t do this, the squirrels take every single apple before they are ripe. And, because single-use plastics are a huge source of pollution on this dear old earth, be sure to re-use your bags over and over again. Flower pots need drainage holes but often the holes are too big, and soil leaks out. 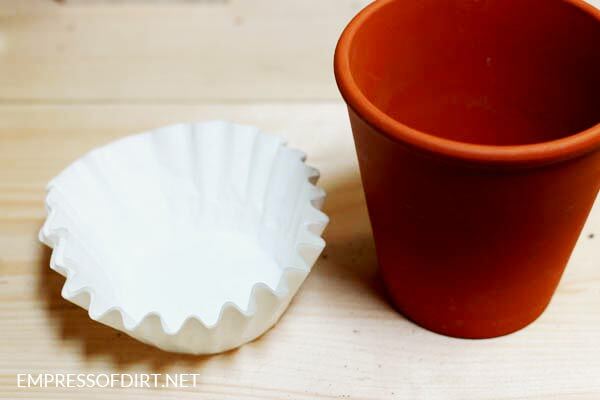 Use paper coffee filters in the bottom of pots to allow drainage of excess water without soil spilling out too. Scraps of fine mesh window screen also works well too. Old plastic pop bottles can be used for all sorts of purposes. 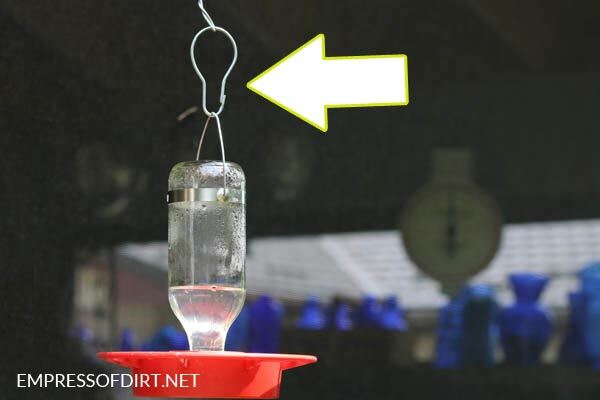 I use them for filling my tube-style bird feeders as a large, deep funnel. • Cut the base off the bottle. 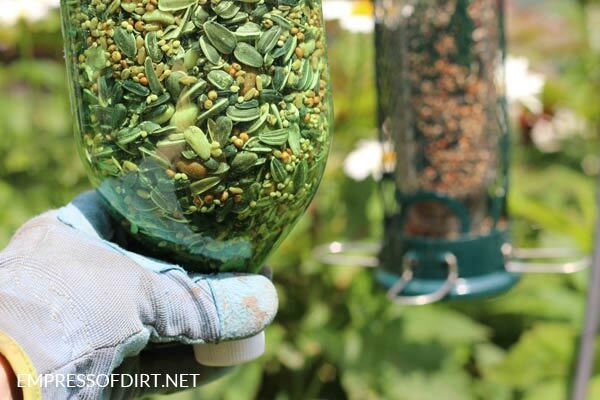 • Fill bottle with birdseed. • Hold over bird feeder. • Remove lid and feed will go directly into the tube. Metal shower curtain hooks are very handy for hanging bird feeders and flower baskets. They’re strong but also make it easy to remove items as needed. There are a lot of recipes online for homemade insect controls. Avoid stuff like this. Household cleaning products including dish soaps and detergents act as broad-spectrum killers, harming everything you spray. b) determine whether the cost of a proper treatment is worthwhile. Sometimes things like aphids can just be removed with a spray of the garden hose. And other pests like Japanese beetles can be hand-picked. Grocery store baked goods are often sold in these plastic clamshells. Many of them have air holes in the bottom which provides drainage, making them useful for seed starting. Ok. Tell me your hacks and tips! I poke old wine bottles into the ground at the end of my garden rows. I write the name of the veggie with a paint pen. This makes a plant label and hose guard in one.